Nigel practices remedial/sports massage Nigel practices remedial/sports massage and sports therapy. Nigel became interested in remedial massage through his personal gym training, sport and competition. He has experienced first hand the excellent assistance and support that massage offers, as he has often sought the treatment to help his own sporting issues. Nigel is very much a massage expert. He is involved in teaching massage as well as teacher assessment. This teaching and assessment ensures his excellent standard of massage. He also runs back care education classes. His mixed sporting and academic background has meant that he approaches massage from both a doctor and patient point of view, making it easier to relate to his clients. Nigel initially was a Sales & Marketing manager for local farmers, and during this time he built up an initial interest in massage. In 1994 he studied at the Midland School of Massage in Nottingham, achieving an MMST. From there he gained experience and further practical training with Michael Pook, a distinguished local osteopath. After gaining more experience, Nigel studied full time at Burton on Trent gaining his Masters (IIST) amongst other additional qualifications. From here he became self employed as a mobile therapist, as well as becoming a teacher at Burton College and Stephenson College. He also became a private tutor in 2000 furthering his teaching scope. Nigel enjoys massage greatly and his skills are used in many different areas. 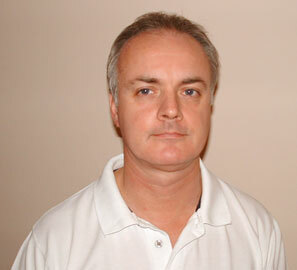 He is a specialist in sports massage, and has been involved in sports events throughout the UK. He also has been involved in everything from touring theatre to pop concerts. Nigel is one of our regulars at the Clinic.